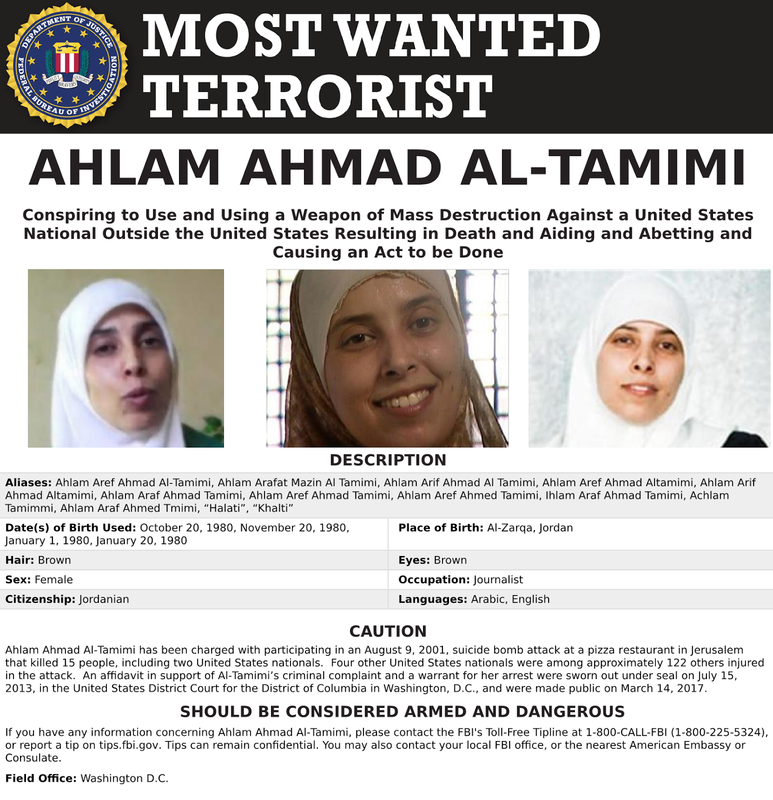 We had the privilege yesterday of being asked by Prof. William A. Jacobson of the excellent Legal Insurrection site to contribute a comment to his article "U.S. to seek extradition of Ahlam Tamimi, the Savage of Sbarro Pizzeria bombing". If you haven't read it, can we suggest you do? It gives background and a framework for understanding yesterday's events in Washington - the announcement by the Department of Justice of meaningful legal steps against the woman who for years has publicly boasted of having masterminded the massacre-by-human-bomb at Jerusalem's Sbarro pizzeria on August 9, 2001. That woman, Ahlam Tamimi, lives the life of a celebrity in unimpeded freedom today in Amman, Jordan. Now, finally, there is a warrant out for her arrest and a prospect that she will be brought to trial in the United States under US law. My wife and I were aware from about 2005 of efforts to have the mastermind of the Sbarro pizzeria massacre released on one spurious basis or another. 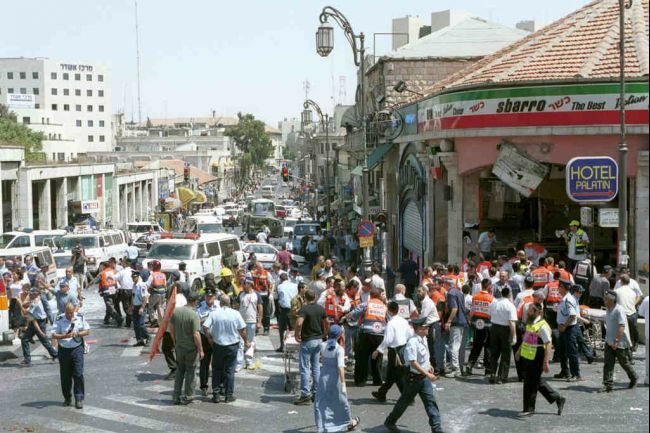 Our daughter Malki was murdered there at the age of 15. We wrote and spoke against the idea of convicted terrorists being released early dozens of times and in several countries. Then in 2011 the Shalit Deal took shape. Israel catastrophically gave in to Hamas’ demands and Ahlam Tamimi’s name was in the walk-free list. We were shattered. Even before the deal was done, we predicted what this might mean and, in the years since then, most of what we feared has come to pass. In fact, in some ways, the reality has been even worse than that. Five years later, it’s apparent that a sealed complaint was already been filed with a Washington DC court within about a year of that first meeting and prior to several subsequent meetings we had with them. We got vague messages that expressed support for what we wanted but no actionable information. We were immensely frustrated. We have a better understanding of why things were done that way. It’s evident as of today that the government’s lawyers are seriously intent on pursuing the Tamimi prosecution, and have been making vigorous efforts in secret. The obstacle is clear: Tamimi lives in Jordan where she was born, where most of her family lives and where the vast majority of the population call themselves Palestinians. The government of Jordan does not want to see her extradited. Our understanding is they are not co-operating with DoJ’s efforts. This is about justice in the truest sense of the word. When it affects others and not you, justice can seem an abstract notion. But it’s not an abstraction. Civilized societies cannot function when justice is trampled. We know there is more work to be done. 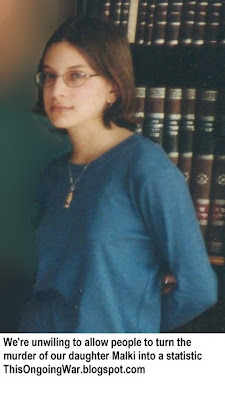 Our daughter Malka Chana was murdered in the summer of 2001. In the years that have followed, my wife and I have lived through a multi-stage trauma with twists that could have been scripted for the movies. One of the most soul-destroying aspects has been the process of learning what people really mean when they talk about justice. People, in this context, means ordinary people on the street where we live but it also means prime ministers and presidents, secretaries of state and ambassadors, along with politicians of every rank and orientation. Today, we met with people from the US Department of Justice, some of whom we have met with for discussions repeatedly in the five years since I first went to Washington to ask them to bring Ahlam Tamimi, the woman who planted the human bomb at Jerusalem's Sbarro pizzeria, to justice. If those earlier meetings were stressful and difficult, today's was in some ways even more difficult. This time, facts and events were openly discussed, unlike in the past, and we learned to our relief that the US government believes Tamimi will be convicted and that justice will be served. But there's an important bridge to cross first: she has to be brought to the United States, and this is something that requires the co-operation of America's valued ally in the Middle East, the Hashemite Kingdom of Jordan. The Jordanians speak about justice a great deal. But from watching them over the years, there's no doubt they mean something very different, something mostly unrecognizable to us, when they invoke the concept of "justice". My wife Frimet and I know that if justice is going to be done to the memory of our Malki, considerable pressure will be needed. We are now busy trying to find who is with us in that quest, and who is not. Obviously, justice is very much on our minds right now. In fact, that has been consistently true since August 9, 2001. Thank you Arnold and Frimet Roth for all the work you've done remembering your daughter Malki and all Israeli victims of Palestinian terrorism. 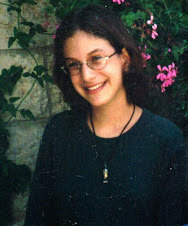 Your writings about Malki and her deranged Murderer is one of the main reasons I believe the Trump administration wants your daughter's murderer to face Justice in the U.S. If Jordan doesn't want to extradite this Islamo Nazi killer that murdered your daughter and 14 other civilians, the U.S should cut all aid to Jordan immediately.